As soon as someone dials your DIDforSale phone number, DIDforSale will send an HTTP request to the weburl you have configured with the phone number. How do I know which URL is being connected with a specific phone phone number? Log in to your DIDforSale account, click on a phone number and see which URL its linked with. You can direct each phone number to connect with unique URL’s if you have specific instructions/purpose for them. What is the importance of URL connected with the phone number? This URL holds the instruction file defined by you. So for a phone number to be handled in a specific order, there has to be a URL that its linked to. This URL holds the dial plan or the instruction file that’s created by you. 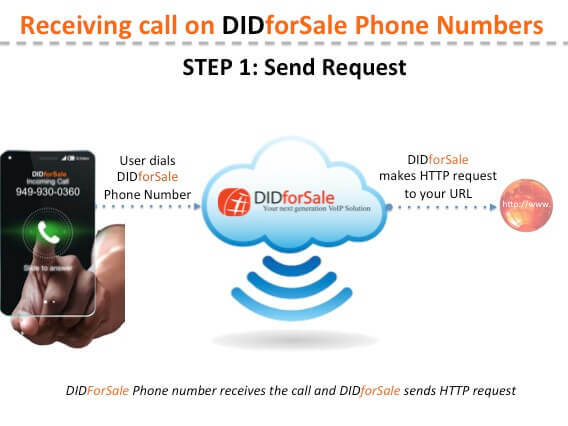 When someone dials your DIDforSale phone number, an HTTP request is send to the connected URL, The system then will wait to get response from the <didML> and handle the call respectively. Idea is to give you flexibility to built a dynamic application. So when we send first request for the URL, we also pass some information about the call in the post variables. You can use all or some of them. To: The number that end user dialed. callSid: Unique id for each call. Can be useful for reporting purpose. Direction: Whether the call is an inbound or outbound call.